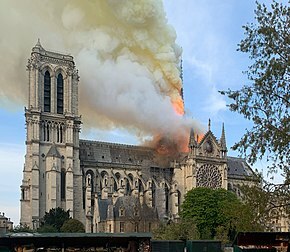 On 15 April 2019, just before 18:20 CEST, a structure fire broke out beneath the roof of Notre-Dame Cathedral in Paris. By the time it was extinguished 15 hours later, the building's spire and most of its roof had been destroyed and its upper walls severely damaged; extensive damage to the interior was prevented by its stone vaulted ceiling, which largely contained the burning roof as it collapsed. Many works of art and religious relics were moved to safety early in the emergency, but many others were damaged or destroyed. The cathedral's two pipe organs, and its three 13th-century rose windows, suffered little to no damage. Three people were injured. President Emmanuel Macron said that the cathedral would be restored, and launched a fundraising campaign which brought in pledges of over €1 billion as of 22 April 2019[update]. It has been estimated that restoration could require twenty years or more. More than 400 firefighters were engaged; another hundred worked to move precious objects to safety. The fire was primarily fought from inside the structure, which was more dangerous for personnel but reduced potential damage to the cathedral; applying water from outside risked deflecting flames and hot gases (at temperatures up to 800 °C or 1500 °F) inwards. Deluge guns were used at lower-than-usual pressures to minimise damage to the cathedral and its contents. Water was supplied by boats pumping from the Seine. Firefighters eventually abandoned attempts to extinguish the roof to focus on saving the two towers, which were integral to the structural survival of the entire edifice. Twenty firefighters attempted to climb the towers' narrow spiral stairs, but were driven back by heat. Around 23:15, officials reported that the towers were out of danger and the fire had weakened; it was considered completely extinguished after about twelve hours. The Paris fire chief said the bell towers and other parts of the building would have collapsed if the fire had continued for another 30 minutes. One third of the roof remained. Adjacent apartment buildings were evacuated due to concern about possible collapse, but on 19 April the fire brigade ruled out that risk. One firefighter and two police officers were injured. The cathedral contained a large number of artworks, religious relics, and other irreplaceable treasures, including a crown of thorns said to be the one Jesus wore at his crucifixion, a purported piece of the cross on which Jesus was crucified, the Tunic of St. Louis, a much-rebuilt pipe organ by Aristide Cavaillé-Coll, and the Virgin of Paris statue of Mary and the baby Jesus. Some artwork had been removed in preparation for the renovations, and most of the cathedral's sacred relics were held in the adjoining sacristy, which the fire did not reach; all the cathedral's relics survived. Some contents were moved by a human chain of emergency workers and civil servants. Many valuables that were not removed also survived, but the state of many others remains unknown. Some paintings, apparently only smoke-damaged, are expected to be transported to the Louvre for restoration. A number of statues, including those of the twelve Apostles at the base of the spire, had been removed in preparation for renovations. The rooster reliquary atop the spire was found damaged among the debris. The two pipe organs were not significantly damaged. Some[which?] of the cathedral's bells were preserved,[further explanation needed] including the bourdon. The liturgical treasury of the cathedral and the "grands Mays" monumental tablets were moved to safety. The following Sunday at Saint-Eustache Church, president and Paris archbishop Michel Aupetit honored the firefighters with the presentation of a book of scriptures saved from the fire. Chartres Cathedral was rebuilt with wrought iron trusses and copper sheeting after an 1836 fire. French prime minister Édouard Philippe announced an architectural design competition for a new spire "adapted to the techniques and the challenges of our era." ^ "Notre organization" [Our organization] (in French). Fondation Notre Dame. Retrieved 25 April 2019. ^ Charlton, Angela (21 April 2019). "Paris Easter Mass honors firefighters who saved Notre Dame". AP News. Retrieved 25 April 2019. 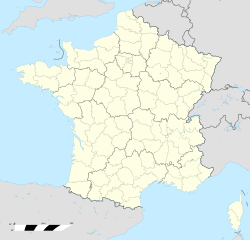 This page was last edited on 26 April 2019, at 01:10 (UTC).